The Shield’s profits are divided equally among the 124 clubs that competed in the previous season’s FA Cup. Each team donates the money to an organization of its choice – or, rather, to a national charity acceptable to the FA. (Left to their own devices, most clubs would probably pick themselves.) The whole event is supposed to take place in a light, fun atmosphere. Tickets to the Community Shield, which is held at Wembley Stadium, are more accessible than FA and League Cup final tickets. The weather’s always nice and everyone is excited about the start of the new season. And that’s where the goodwill ends. The “Community” Shield – or “Charity” Shield, as it was known between 1908 and 2002 – is football’s second-most-annoying misnomer (behind “The Championship,” England’s second division). In the 1974 shield, Leeds United’s Billy Bremner and Liverpool’s Kevin Keegan were sent off for fighting. They walked off petulantly – “like small boys sent home for squabbling at a picnic,” David Lacey wrote in The Guardian – and were later suspended for a handful of a games. In 2010, Sir Alex Ferguson – who, of course, is on the record as saying he doesn’t give a damn about the Shield – complained vociferously after referee Chris Hoy’s failure to spot a blatant elbow jab cost Manchester United its victory. If you win the Community Shield, it’s a “step in the right direction”; if you lose, it’s a glorified pre-season friendly, merely another opportunity for McDonald’s to stick up two greasy, ketchup-stained fingers at Morgan Spurlock, Eric Schlosser and people who record their caloric intake in little notebooks. Clubs and their fans can spin the match however they want, inevitably arriving at a positive conclusion. It’s always a win-win: either you take home a trophy or you creatively turn your failure to take home a trophy into an assurance that future trophies are on the horizon, and they’ll actually count, and the referee robbed us, anyway. Amazingly, the Community Shield is one of Europe’s most genuine, least exploited “Super Cups.” For the last two years, the Italian equivalent has been played in China. In late July, Lyon beat Montpellier on penalties in the Trophée des champions. At Red Bull Arena in Newark. Which isn’t to say that England is immune to cynical marketing ploys. Richard Scudamore has spent most of his time as head of the Premier League trying to push through the controversial “39thGame,” an additional round of fixtures that would be held in stadiums across the globe. He’s mostly been shouted down. Whether the English actually care about their traditions or simply enjoy watching foreigners waste their money at Buckingham Palace, it’s difficult to judge. Suffice it to say that enough people think enough other people value sporting ritual that there would be a massive uproar if organizers ever decided to move the Community Shield abroad. 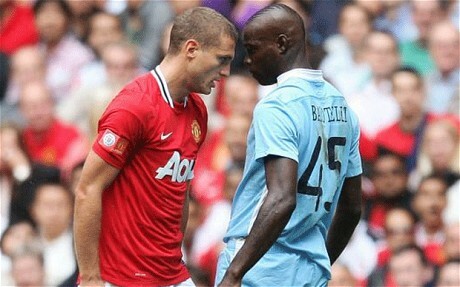 Next Sunday, Manchester City plays Chelsea in the 2012 Community Shield. The match-up is interesting for a couple of reasons. First, Manchester United isn’t playing; that hasn’t happened since 2006, when a Peter Crouch header won the game for Liverpool. Second, City and Chelsea are the two wealthiest teams in the Premier League, and the fact that they’re playing each other in a Super Cup reminds us that modern football is all about money. Chelsea, in particular, has spent rather extravagantly lately, shelling out on the likes of Marko “Tolkien’s Lost Character” Marin and Eden Hazard, who earlier this summer became the first big-time player to orchestrate his own transfer saga on Twitter. City, on the other hand, is cutting back. Last month, Roberto Mancini – once an audacious player, now a severe coach – complained publicly about the club’s lack of transfer action, which, considering that City has spent hundreds of millions of pounds over the past three seasons, was a bit rich. Neither Mancini nor his Chelsea counterpart Roberto Di Matteo has ever won the Community Shield. Presumably, that’s not something that keeps either of them up at night, but nevertheless, it will be nice to see someone other than the utterly apathetic Ferguson hauling what is essentially a glorified dinner plate onto the team bus. People like the shield not because of what it is – a violently contested marketing stunt masquerading as Auntie May’s charity bake sale – but because of what it signifies. If the Community Shield is a week away, that means the Premier League season is two weeks away! The match itself is more competitive than your run-of-the-mill preseason friendly, and fans usually enjoy the day out. Alcohol flows. Both teams go home happy. And tucked in a private box, a bunch of corporate executives smile over their Big Macs. To the fans who win it, this trophy is always super important, but the ones who lose claim it is just a friendly match :). Yep, completely agree with you. The Community Shield is really an opportunity to raise money for those in need, thus, it’s aptly named. IMO, the Shield is almost better than the league and cup; the Community Shield is the sum of everything that makes football so beautiful.